Copywriting is one of the many skills that online content producers must master. Give yourself a skills boost by understanding what makes the microcopy on your websites work well. How much time do you save and how many conversions do you gain by optimising the labels on your homepage? Get an idea for the answer to that question here. Microcopy essentially refers to the small parcels of text, either a word or a single sentence, that help viewers choose what to do next. Here, Mashable uses labels above each section to aid navigation and keep users interested in browsing through their site. For them, more clicks equal more revenue for the company. But navigation isn’t the only aspect of writing that web professionals need to consider when brushing up on microcopy strategy. If you start targeting the areas of your site where visitors are having the most issues, you may find the secret recipe for microcopy success. Website conversions are made by solving customers’ issues. When multiple users are having the same issue on your site, there is likely an opportunity for a microcopy solution. For example, you may receive several support tickets letting you know that your customers have entered information into your system that isn’t showing up in their account. You know that your program hasn’t had time to process and upload the information, and that it takes up to 24 hours before new information will appear in the dashboard. Each time you receive a request, one of your customer service representatives will have to respond to let the users know this. Not only will your customers be informed and feel secure with your platform, but you will be saving money as well. Microcopy can often be used to provide your website with simple solutions to otherwise timely or redundant problems. When labeling the details of your web pages, you should scrutinize your language. This means that you should be using the most appropriate labels for your audience. Think about it: if you are targeting women, more emotional language should be used. Intellectuals require thinking words in a way that subconsciously appeal to emotions. Are you speaking the language of your target market? As you can see, Vanity Fair invites shoppers to visit their store, while the Dollar Shave Club wants dudes to “do it,” for a few bucks a month. Both calls to action are asking for the same action, a purchase. The language, however, is entirely different. So, when writing your calls to action and other information throughout your site, keep in mind who is likely to be reading this copy, and what words might best appeal to them. Are Your Posts Labeled for Reader Convenience? You may want to ask yourself this question before you decide that your website is as user-friendly as it can get. Some people want to know whether they’re clicking onto a slideshow or an article. If you have labeled your content with generic titles, there might be more you can do, i.e. be more distinct. 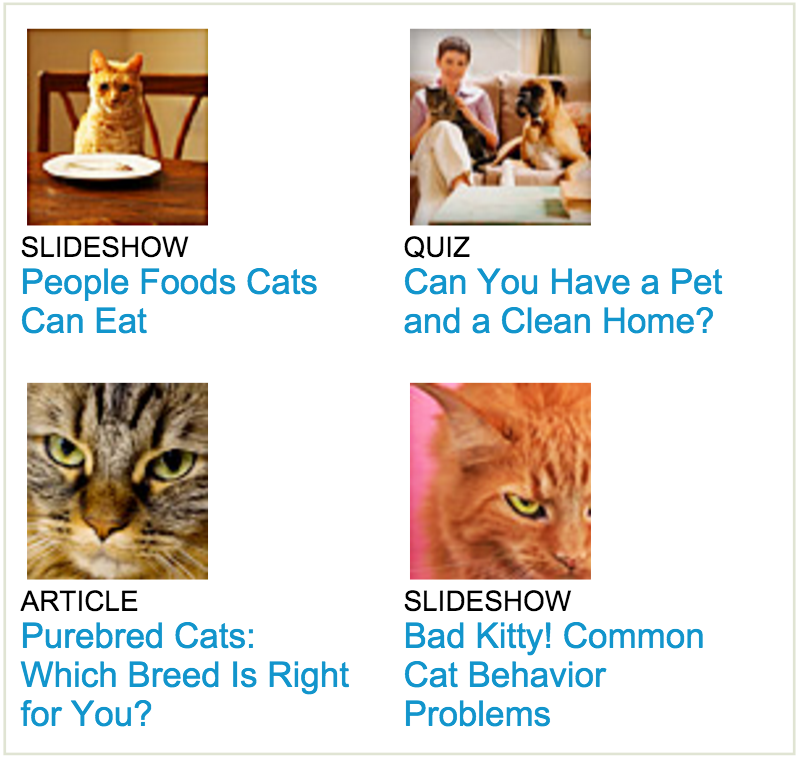 On WebMD’s sidebar of their Cats page, posts are labeled specifically. Many sites will entice you to the next page with catchy titles, but specific labeling is a microcopy technique that goes a step beyond clickbait. Some people want to take a quiz rather than view a slideshow with images and information. This way, readers can make a more informed decision, and are more likely to stay on the site or move to a sponsored article. These concepts can make a world of difference in the user experience of any website, which is how you can ultimately gauge success. Start applying these ideas to implement changes within your content today. Make sure to make adjustments from time to time if you notice that something isn’t working as well as you hoped. Let us know how writing or rewriting your microcopy works out for you in the comments below, or share some of the changes you’ve already made to your microcopy and how that affected viewer engagement. Nice post Megan. Never thought about Microcopy in this way. Would you say wrapping a Microcopy in h -tags is the best practice?